Some say the eyes are the key to the soul...! Aren't they? Well in terms of 3D characters, eyes are probably one of the most important part of any characters because that is what we all relate to when watching. Eyes are also fairly time-consuming to create, especially for realism. Have you ever struggled with getting your characters eyes to look just right, finding that perfect iris color and pupil shape? If so this product is for you! 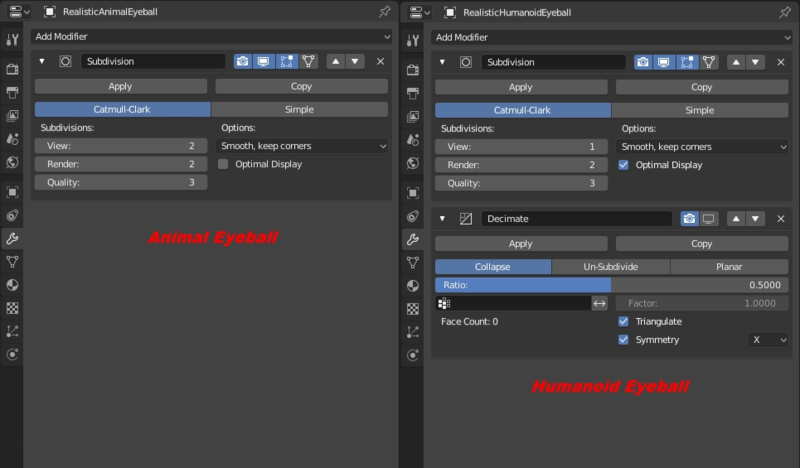 I created these two eyeballs as a library for myself so I don't have to create other one's for time-saving sake, I can simply create variants derived from it. 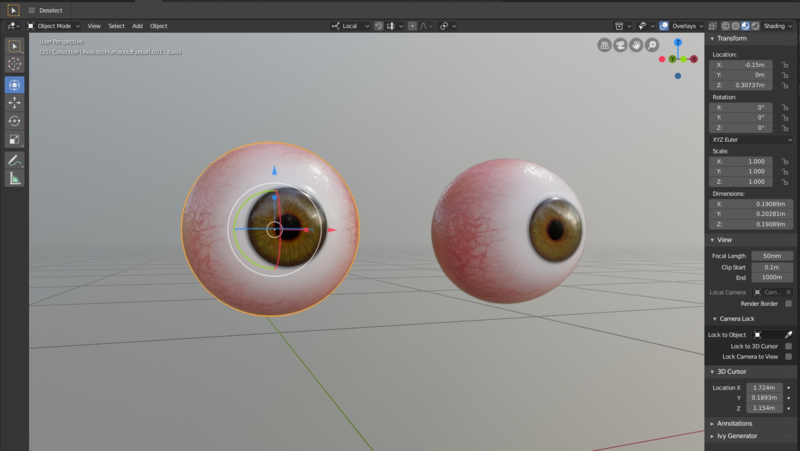 - Version 1: Two eyeballs with materials and textures. This version you needs to edit everything manually (Material Nodes & Shape keys). Very easy to add to any existing rig. - Version 2: Two eyeballs with materials and textures & easy "N" side panel properties. This version you simply select the eyeball and edit the properties in the N side panel and it controls the rest for you. Very easy to add to any existing rig. 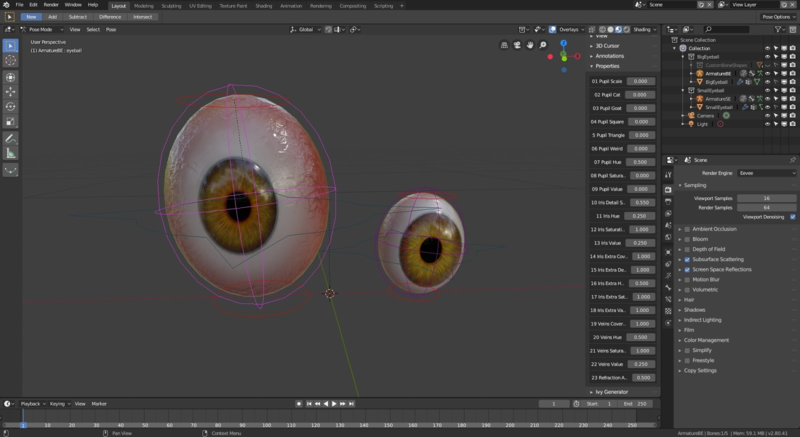 - Version 3: Two eyeballs with materials, textures, rig & easy "N" side panel properties. This version is fully rigged with full "N" side panel bound to the body bone for easy animation of all the material properties as well as the shape keys. Also very easy to add to any existing rig. Create eyeballs for your every character needs in 2 minutes instead of hours. Change it on the fly to evolve your designs or find variations that suits your characters. Works in Eevee & Cycles in Blender 2.8. Consider this product as a library asset you can append to your scenes and edit to your liking while keeping the original one intact so you can use it over and over again. These two eyeball is one fairly complex mesh with four materials. It is partially procedural (the iris part is) and partly textured (the bloody part of the eyeball, the veins) which was hand painted in Sketchbook Pro & Krita. It is all UV based so you can easily change the pivot point and mirror the eyeball to have two or more if needed. This makes the iris completely editable. 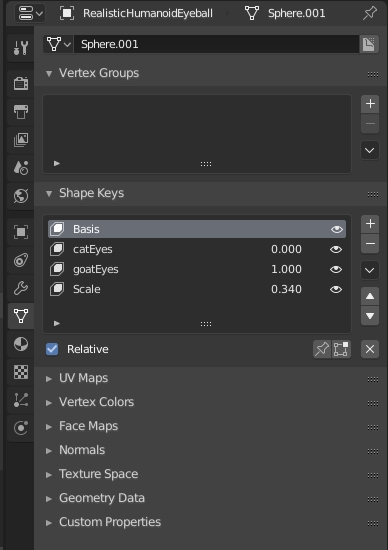 You can change the overall iris color, the overall scale of the details, also change extra iris contour details and colors to fit your every character needs. There is also shape keys for iris scale (small & big) as well as shape change such as cats & goat type iris which also works with the scale and also blends well to create other shapes. The veins are also controllable if more or less red eyes are needed. Even a dead eyeball is totally doable. Editable nodes are color coded in blue and frames with information on what those nodes do so its easy to know exactly what to tweak and what should be left alone. The later version includes an easy "N" side panel property setup that allows for very quick editing of all the shape keys and material nodes without having to go to the node editor & properties panel under the mesh tab. Simply select the eyeball and edit on the side panel (press N to pop the panel) under properties. The latest version has all the previous features and is completely rigged and ready for animation and also to be added to existing rig. Please note that these eyeballs work best with Subsurface Scattering (separate Albedo checked) and Screen Space Reflection (refraction checked) enabled (Looks odd without). 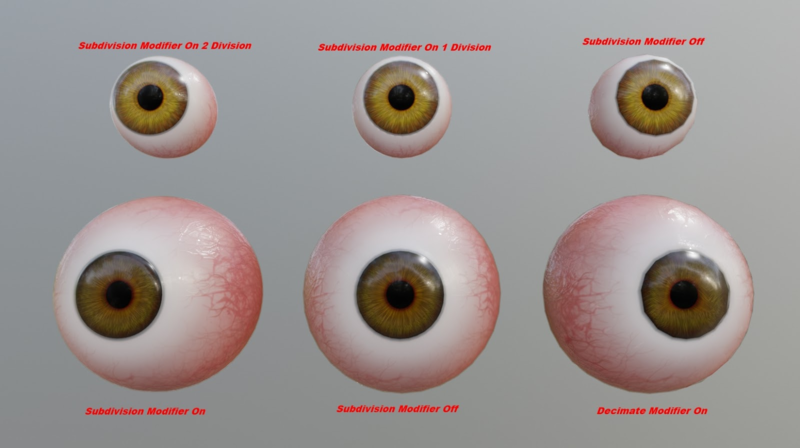 Having a completely editable eyeball like this also helps with design, you can quickly change and experiment on the fly to get to the best possible results for your characters. Added Usage overview video of all 3 versions in the documentation. Updated the written documentation. Now covers all 3 versions. Added another variant of the asset with easy to edit N panel setup but bound to the rig, not the object. This one is very fun to use and to animate, its also really easy to just append to another rig and simply parent the root of the eye rig to any existing head rig. Added a variant of the asset with an easy to edit N panel setup. This variant is a little more expensive due to the extra time spent at making it better suited for less advanced users. Please see the documentation to see the difference. Added one more eyeball with the exact same setup, this added one is best suited for small to medium characters (critter size), and the bigger eyeball is best for bigger characters (Human or bigger). Works the exact same way. Basically just added a variant of the product completely free of charge. There is 3 versions and a bundle of all 3 of this product to choose from. This documentation covers all 3 different setup, so please read carefully to make sure you follow the appropriate workflow for the version you chose. This version works a bit differently then the other version in the sense that you do not need to go edit any of the materials nor the shape keys. I've added a convenient N Panel properties setup that allows to tweak everything directly in the panel. You can simply follow step 1, 2, 3, 4 & 10 from version 1, then you only need to press N to open up the side panel, with the eyeball selected open up the Properties and edit away using the reference above. 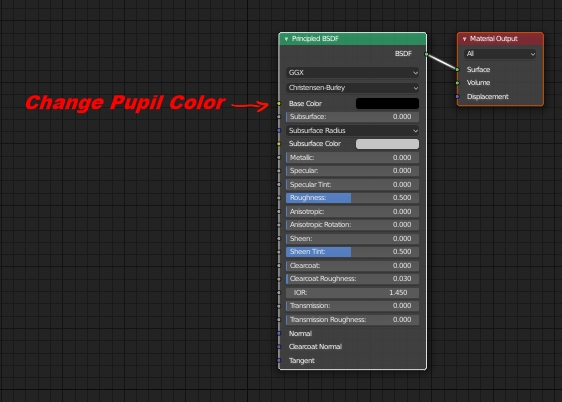 The only thing you need to edit manually is the subdivision modifier &/or the decimate modifier on the bigger eyeball. This version works a bit differently then the other version as well in the sense that its rigged and also has a N Panel to control the materials & shape keys. You can simply follow step 1, 2, 3, 4 & 10 from version 1, and then you have the rigs. The top and bottom red circular handles control the squash & stretch. The purple sphere handle around the eyeball is the body and it controls the rotation of the eyeball as well as the N Panel, simply select body bone, press N and the same properties then version 2 appears in the side N Panel ready to edit. The blue handle is the root bone. You can use it for placement, animation, you can parent that bone to another armature. Let say you want a squashed eyeball for a cartoon character, just parent the armature object to the head bone and voila, you have an eyeball that has a rig and full control over the material properties as well as the shape keys, you can squash it, stretch it and even make it pop out and fall on the floor. Here is a 11 minutes video showcasing how to use all 3 versions on Suzanne monkey. Basically showing the advantages and disadvantages of all 3 versions. If you have any questions regarding this asset, please send me a direct message on the Blender Market and I will answer as fast as I possibly can. Why multiple versions with different prices? Simply put I want to make it available to anyone for any needs. Just need the eyeball, get version one! Don't like nodes, get version 2! Would like a rigged version, get version 3! You'd like them all, get the bundle! Does it work in both Eevee & Cycles? What is the benefit of having an editable eyeball? First, it saves you time, you only need 2 minutes to setup the perfect eyeball. Second, it can greatly enhance your workflow by allowing you to experiment faster, quickly changing and seeing live the results of the changes. Third, it saves you money and allows you to have a great looking realistic eyeball at your disposal for any character projects you may have. Why is my render different then my viewport? 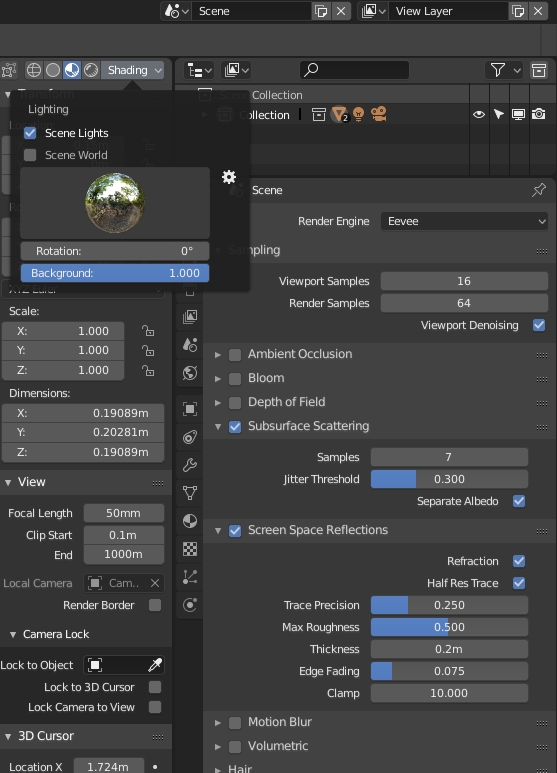 You most likely don't have a world HDRI setup in you world nodes. Just make sure to set one up. Why is my mesh edit not taking effect? You most likely have one of the non basis shape keys selected when you edit, this results in a strange behavior. Make sure to select the Basis shape key before any mesh edits. Also be aware that it will affect the rate at which the shape keys do effect if you change the scale in edit mode as opposed to object mode. Why does my eyeball appears washed out? Make sure to turn on Subsurface Scattering with Separate Albedo checked ON as well as Screen Space Reflection with Refraction checked ON. Will there be updates of major changes for this asset? Most likely from time to time when I do add changes for my own character creations, I will update with the extra edits for everyone. I already added a few features already ;) Will most likely do to in the future! Can I create my own iris shapes? Absolutely, just add a shape key and edit to your liking. Does this work in Blender 2.79b official or daily builds? No, this was created in blender 2.8 and isn't backward compatible. What a fantastic product! Soooo easy to use, and it looks amazing... photorealistic! Thank you for making my life easier!! I bought the package with all 3 products. Using the one with the N-panel for now (whilst I am practising), but foresee that I will use the one that has the rigging build in later when I start my actual animations. Thank you for offering it at such an affordable price. I LOVE it! Completely rigged set of two eyeballs, big and small. Ready to animate with a friendly rig and complete controls over colors, details and Pupil shapes. Simply press N and open the side panel with the body selected and edit the properties to your liking. Even animate them! Same as version one but without the need to go to the nodes and to the shape key panel, simply press N and open the side panel properties and edit to your liking. 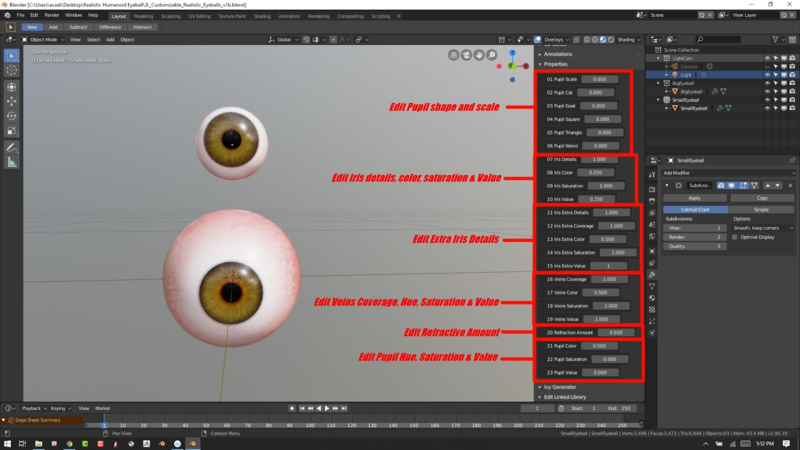 Both eyeballs, big and small, fully setup with materials and easy to edit nodes that are color coded and grouped with annotations for easy edit. Six shape keys that are very useful and you can easily add more if needed.